Within minutes of anywhere in Genesee County, you can be cooling off in a clear blue lake or chilling out on a sandy beach, paddling down a scenic river, launching your boat for an afternoon float, fishing for supper, or watching your kids jump around on a Splash Pad. If you love being in, on, or around water, you’ll love all the near-by options in your Genesee County Parks! For starters, check out the swimming beaches at Bluebell Beach along the shore of Mott Lake and Buttercup Beach along the shore of Holloway Reservoir. Bluebell Beach at 5500 Bray Road offers great, lake swimming plus a barrier-free Splash Pad and universally accessible playscape that kids love. Clover Beach at Linden County Park is another visitor favorite with a scenic rock staircase leading you down to the sandy shore of Byram Lake. 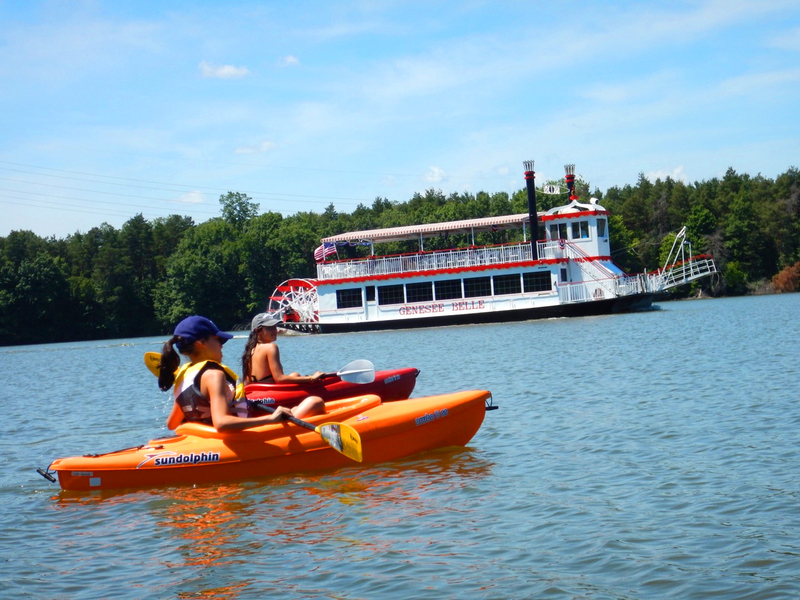 Bluegill Boat Launch gives you access to beautiful no-wake Mott Lake. Walleye Pike Launch is on the Holloway Reservoir, where those in the know report respectable catches of walleye, bluegill, bass, pumpkin seed and perch. Free picnic tables and grills are nearby, so you can cook your fish dinner right on site! Use fees for our paid launches are collected from now through early September. Hydrographic maps of Mott Lake and the Holloway Reservoir can be downloaded from our website by clicking here. If you prefer gentle meandering in a canoe, kayak or paddleboard, you can portage into the river and lakes from any County Park shore except designated beaches and For-Mar Nature Preserve & Arboretum. Or, if you prefer a launch site, try out Richfield County Park, Buell Lake County Park or Zemmer Park to name just a few. Go to the Genesee County Parks online park directory for descriptions and maps of all the Parks, and learn about the rivers, creeks, lakes and beaches that are yours to explore this summer! Remember to download a copy of our Family Fun Guide so you can participate in some of the 1000+ programs we have going on from now through October. Get away right away for summer fun right around the corner in your Genesee County Parks! Treehouse Masters Came to For-Mar and Built Something Amazing!